We feel that the delicious food we provide is some of the best available in the country and we aim to put Spitting Pig Lincolnshire, hog roast catering, firmly on the culinary map. The most important thing for is the taste of food. We believe the hog roast that we provide is the best around. My name is Rob and I own Spitting Pig Lincolnshire. I have been in the catering industry for a significant number of years now, working my way up to being a head chef in the army, catering for thousands day in day out. This is where my high standards of presentation, service and professionalism has stemmed from. My whole family have embraced Spitting Pig Lincolnshire, my wife, son and daughter are all part of the team and we love what we do. A combination of the finest meats, state of the art machines and our fully trained chefs results in mouth watering food for everyone to enjoy. With a great selection of menus available you can decide what you want your hog roast to be served with. The best thing about a hog roast is that it can be dressed up or down making it suitable for all levels of formality. And there are no restrictions on what type of meat that we provide. Whether you are looking to cook a traditional roast beef dinner or have spit roasted pig at a barbecue do it all. No matter what meat you choose the end product will be same; mouth watering and deliciously tender meat for everyone to enjoy. And it is not all about the delicious food; it is the experience of a spit roast that is unique. 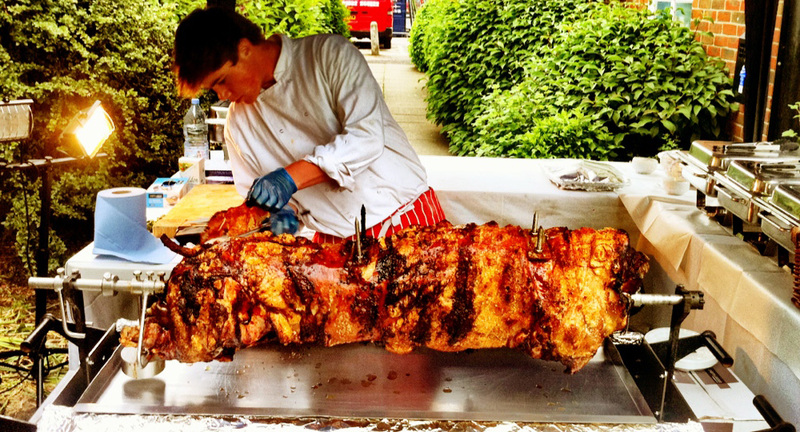 We help to create a warm and authentic atmosphere at any event by spit roasting your meat in front of your guests. This is an unrivalled dining experience and what better way to whet the appetites of your guests than have their food slowly spinning and cooking in front of them. The sight and smell of a hog roast is unlike any other form of catering. Our delicious food teamed with our excellent service, staff and machines is the perfect solution to all your catering needs. We make sure that the food for your event is perfect and that you and all your guests are blown away at the quality of service that we provide for you. Here at Hog Roast Lincolnshire we cater for the entire county. Whether you’re having a hog roast Mablethorpe event, a family party in Gainsborough or organising a charity event in Boston, we have it covered. We are very proud to be able to cater for the beautiful county of Lincolnshire and with major events such as the Lincoln Markets we want as many people as possible to be able to experience our mouth watering hog roasts. One of the most famous things that Lincoln is known for is its markets. Whether they are the regular farmers markets or the famous Christmas markets they attract thousands of tourists every year to the area. There is no event too big or small for us, we aim to please. Whether you’ve just finished a round at the famous Skegness golf course and are in need of catering for you and your friends or you’ve a long day shopping at the markets and you are looking for something to eat, we’ve got it covered. We aim to make our food as famous as the town we cater for. Spitting Pig Lincolnshire is a professional catering company specialising in hog roasts and BBQ’s across Lincolnshire. We can cater for anything from small informal parties and corporate events through to large formal banquets and weddings. Here at Hog Roast Lincolnshire we believe we have a range of menus to suit every occasion but can also provide a bespoke menu to your exact requirements if you prefer. All our staff are experienced in their area of expertise and hold the relevant food hygiene qualifications and we hold full liability insurance. 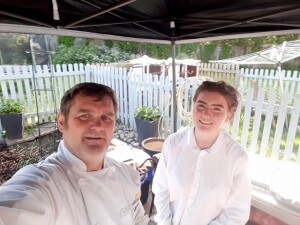 The quality of our equipment and our staff along with many years of experience in the catering and Hog Roast business allows us the confidence to claim we can provide a catering experience second to none. All our Hog Roast Machines are CE Approved and comply with all environmental health requirements and are gas tested and certified on an annual basis. Our fully equipped gazebos and gas operated machines mean we can cater for parties outside in the middle of a field if required. 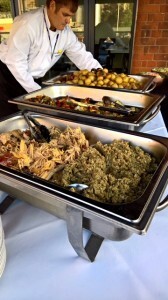 But we are equally capable of catering within a customer’s premises, the hog roast machines we use are safe to be used within the confines of a hall, function room or inside a marquee. On accepting one of our Party / corporate menus we will discuss your exact requirements and understand factors such as location, venue, access issues and service times. On the day of the event we can come along 6 hours prior to service to cook your chosen meat and prepare any side dishes on site or alternatively we can arrive 1 – 2 hours before service time with your chosen meat already cooked. With our wedding menus and larger parties or corporate events we can meet with you personally prior to confirming your booking to discuss the menu options and services included in detail. We will gain an understanding of your exact requirements on the day of the event and view the venue if possible, providing assistance with the layout plan and planning of the day. In the case of a wedding, on the day of your wedding we would arrive in plenty of time prior to service start. Our chefs will cook your chosen meat and prepare all side dishes, canapés, deserts etc on site whilst our waiting staff will lay all the tables, table arrangements as well as the wine and water as required. Machine Hire is an alternative service we offer, so if you want the challenge of a D.I.Y hog roast or you run a restaurant or hotel and wish to provide your customers with something a little different why not hire one of our machines. Machine hire is a very cost effective catering solution and we can even provide the pig or alternative meat if required. Spitting Pig Lincolnshire will deliver and then collect the machines and the price includes a bottle of gas and instructions and a demonstration on how to use the machine to produce perfectly cooked meat. Hog Roast Lincoln is a hog roast specialist company who cater for every event under the sun from school fairs to weddings anywhere in the UK. We also operate a worldwide service and able to supply hog roast machines straight to your door. We prepare juicy lip-smacking hog roasts which have been professionally roasted to perfection so you can enjoy great food whatever the occasion. We pride ourselves on offering a first-class service with packages to cater for you individual needs, size of event and most importantly your budget. With a wide selection of Hog roast machines and menus to suit all tastes; we are sure you will find something to satisfy your taste buds. We are able to come directly to you, due to our hog roast machines being completely mobile and easy to assemble. This is one of the many areas in which we excel. We make sure that every one of our hog roast machines complies with all environmental health requirements. We make sure that your meat will be cooked in nothing but the best of oven environments. If you feel like varying the type of meat you roast, or roaster will roast pretty much any animal that you desire to cook. 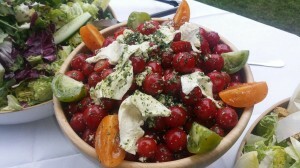 You can choose to take full advantage of our catering service, which will take care of everything from beginning to end. Our experienced staff will not only cook and serve; they can help make sure that your whole event runs smoothly. We go above and beyond to make our customer’s special event a success. If you choose to serve, we can prep a day early. We offer the service of coming out a day early so that everything is cooked and prepped. All that you would have to worry about is reheating the food the next day. This will let you have all the ease and advantages of us catering, without us actually being there. We want you to enjoy our quality cooking and all of your special events and experiences. As we are cooking a hog roast on one of our machines, it has a great presentation. It doesn’t seem to matter how many times people have attended a pork roast, it is always visually appealing as well as extremely tasty. Our machines are very hygienic and keep everything clean in appearance with special draining pans and a very low maintenance build. A hog roast is a great way to excite even the most finicky of people in taste and sight. We have years of experience in the hog roasting business. The machine is very important. We promise you nothing but CE approved hog roasting machines at your catered event. Our machines are hand built using the finest material and latest technology. When you let us cater, you are getting state of the art machines, top-notch staff, and the most professional, friendly service around. We treat you as if we are catering to our friends and family. The success of our business has been built on the patronage of our customers. We want to return the favor by giving the best possible catering service that one could experience. You will also get the best quality meats, a wide variety of sides, and our undivided attention. We will do our best to meet any of your requests and needs in order to make your even perfect. Copyright © 2019 Spitting Pig Lincolnshire . All Rights Reserved.